SAM Membership Renewal Drive 2019-20! District Clerks/Business Manager are designated as a district's key contact for MASS, MASSP, MAEMSP, and META members working in a district and will need to complete the online renewal form. MCASE members and other affiliate members not associated with a school district will complete their own renewal form. While completing the renewal form, the district clerk/business manager will have the ability to unlink members leaving a district and add members new to a district. 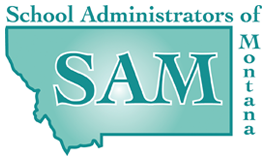 If an administrator begins working in a district after a district's renewal process is complete, the new member should complete the New Member Form to become a SAM member for 2019-20. MASS, MASSP, MAEMSP, and META members working in a district – to be completed by district clerks on behalf of members - Click HERE. MASS, MASSP, MAEMSP, and META members who are NOT currently associated with a district or organization - to be completed by the member - Click HERE. MCASE members – to be completed by the MCASE member – Click HERE. New Members – to be completed by the new member – Click HERE. Institutional Members - to be completed by an institution of higher learning in Montana, to the Office of Public Instruction and organizations whose primary purpose is the support of PreK-12 education - Click HERE. Create your password by clicking HERE and follow the instructions to create your password. Click HERE to view the membership renewal information and instructions created for the online renewal process new in 2017-18. To view a video tutorial to assist you in the membership renewal process, click HERE. For most school districts, the district clerk will be the “key contact” for receiving a membership renewal email and will need to complete the membership renewal process on behalf of the MASS, MASSP, MAEMSP, and META members in the district. This email for membership renewal replaces the annual, hard copy invoice mailing that the district had received in previous years. Some members will be the “key contact” for their personal renewal or organization’s renewal (retiree members, MCASE members, private organizations, etc). Please note that even though you will be receiving membership renewal invoices electronically, membership dues will still need to be paid by check and not credit cards. Going forward, only SAM and affiliate conference registrations will be able to be paid by credit card or check using SAM MemberClicks. Once logged into your profile, you will see the first of two Membership pages where you will see your organization, phone, address, and email of the key contact. Then, you will see a Next button below; click on it and it will take you to the second Membership page. On this second Membership page, you will see a list of all current SAM members in your district. You can click on the name of any member and see exactly what memberships each person belongs to. You will see the member’s contact information first, then the membership type below. Please check each of your members and see that their membership accurately reflects the continuing of that membership or if there is an adjustment or change. If there is any change, just check that affiliate and the relative radio button of what type of membership for that affiliate. If a member is leaving your district, you can unlink that member – simply click on the Unlink to the right of that member’s name. Once you click “Unlink”, also click “None” for that member’s affiliate membership type to remove the membership charge from the invoice. To add a new district administrator that will be seeking a SAM membership, just click on the Create Linked Profile button below and fill out the form that appears; check the type of affiliate for this new member; click on the radio button next to the type of membership for that affiliate. On the Summary page, please confirm your membership renewals and changes that you may have made on this page plus any SAM LPLP registrants. If you need to make any further edits, click on the Previous button to go back. Once confirmed that all is correct, then click on the Next button which will take you to the Payment page. On the Payment page, select Offline payment from How you would like to pay drop down menu, then select Check from Offline Payment drop down menu. And lastly, click on the Submit Form button at the bottom. Once submitted, you will receive an email with a new invoice that will reflect these changes. The old invoice will automatically be voided. Once again, please check your invoice for accuracy in relation to membership dues and SAM LPLP registrations. Please print the new invoice and send back with a check written for the total amount for all memberships to be renewed and any SAM LPLP registrations.